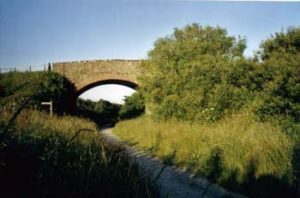 Borough Bridge that once spanned the Ilfracombe to Barnstaple railway line. Now a walking/cycle track. From Mullacott Cross, take the B3343 to Woolacombe and Mortehoe. About one and a quarter miles after leaving the roundabout look out for a fairly inconspicuous turning to the Right (it has recently been marked with some reflective posts) opposite the turning there is a sign Lee, Lincombe and Fuchsia Tea Rooms. Take this road, which is the B3231 continue along this road passing over a pretty bridge which at one time straddled the Barnstaple to Ilfracombe railway line. This obsolete line has been converted into a Footpath/Cycle track. There is a small car park adjacent to the bridge should one wish to explore the area. The path presents a pleasant walk or cycle into Ilfracombe passing the old reservoir en route. After Borough Bridge continue along the road until a give way sign is reached. At this point turn left following the sign Lincombe Lee. The road passes through Lincombe and then descends the hill into Lee. Car parking can be found opposite the Church and at the edge of the Bay. Lee WI Programme for 2019 added. Flower Show Schedule 2019 added. "Click here for details"